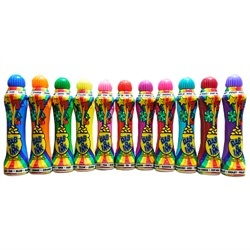 This 4oz dauber (110ml) features an easy to hold oval "pen-grip" bottle with easy flow adapter! The same great quality since 1962, that's right Dab-O-Ink is that good. These daubers have a standard size tip that is easy to remove and replace. I have all the colors in the triangular shaped daubers with the rainbow and pot of gold designs on them.